One, I flew past Mt. 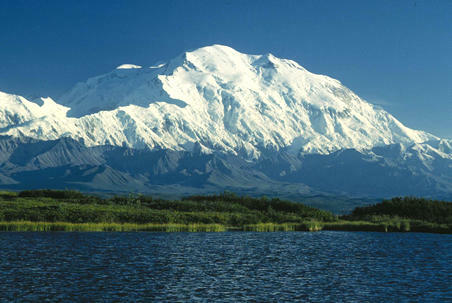 McKinley, err, Denali once. It is the most impressive mountain you will ever see. Seemingly right off the wing of the airplane, it is as tall (20,000 ft.) as it is massive. The mountain is huge! If I can ever find the photo I snapped of it, I will add it to this blog. Two, I didn’t know it was up to the president to do that kind of thing. Does he do this kind of thing often? Seems like a little outside of a president’s priority, but who am I to judge? Three, The poor mountain is going to develop an identity crisis, if it doesn’t already have one. It’s gone by more names than a Cold War era spy. And had its elevation officially lowered. Four, do all mountains already have previous names that merit changing them back? Is this going to be a new thing? Or is it only because it being #1? Five, I really wish I was in Alaska right now too. Six, I wonder if the fish are biting. Seven, what was this blog about? Eight, oh yeah, I’m OK with Denali, but I wish the state of Alaska would’ve done it instead of needing a president to do it. It’s a state rights thing for me. Nine, I feel sorry for William McKinley. He had to be proud to have a mountain, and such a big mountain, named after him. Of course, he’s dead now so I doubt he’ll file any protest, but I hear Ohio has. And ten, I’ve always thought Denali was a better name for the biggest mountain in North America, especially since it means Big Mountain. It’s better than McKinley, and way better than the third alternative, Suburban.